The classic way of serving oysters is opened, raw on a bed of crushed ice, lemon juice, balck pepper and a dash of Tabasco sauce. Champagne is the obvious accompaniment, but a dry white wine is good too! To make the jelly, mix together the citrus juice, sugar and salt in a small pot. Bring the mixture to a slight simmer and add the gelatine. Strain the mixture through a sieve into a shallow flat metal container and place in the fridge on a level surface to set. About 2-4 hours. To make the salsa, mix together the apple and cucumber dice with enough of the lime juice to coat and season. Add the coriander and lime zest and set aside. Once the jelly is completely set, gently remove from the container and place on a chopping board. Using a sharp knife cut the jelly into small cubes. 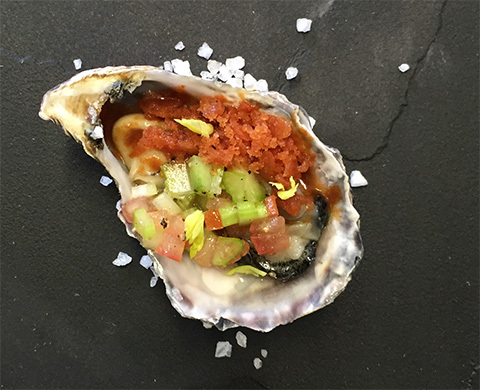 Mix the jelly into the salsa and place a heaped teaspoon of salsa on each oyster. Add an extra squeeze of lime or lemon to taste and serve. Garnish with baby celery leaves or micro herbs. Place all the ingredients for the vinaigrette together in a small squeeze bottle and shake vigorously to mix. 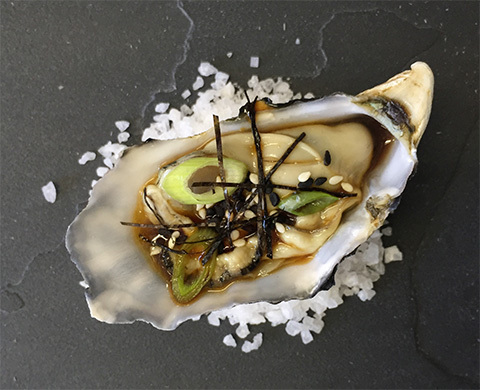 Assemble the oysters: pour 1 tablespoon of vinaigrette over the oyster and garnish with 1 slice of chili, 3 slices spring onion and a few coriander micros. In a small bowl, whisk together the mustard, vinegar and salt. While continuously whisking, slowly trickle the oil in and whisk to form an emulsion. Add the red onions and mix well. 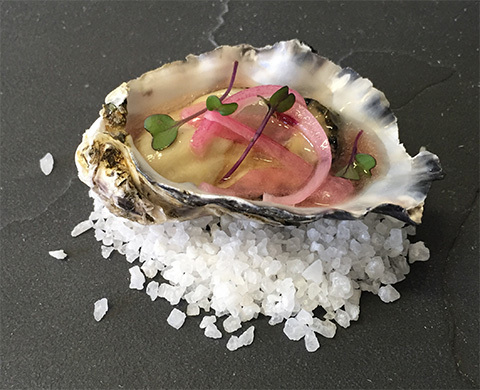 Place a tablespoon of vinaigrette on each oyster. All orders placed for collection will be confirmed within 1-2 hours. 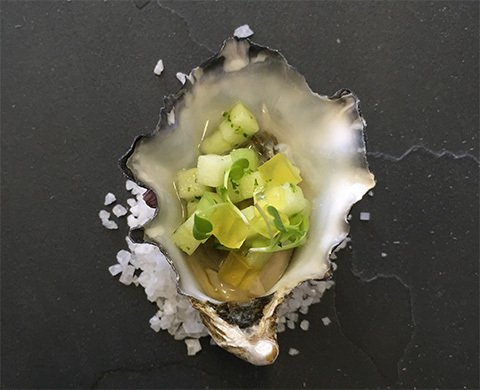 All confirmed orders can be picked up from the Knysna Oyster Bar in the V&A Food Market, Dock Road, V&A Waterfront. 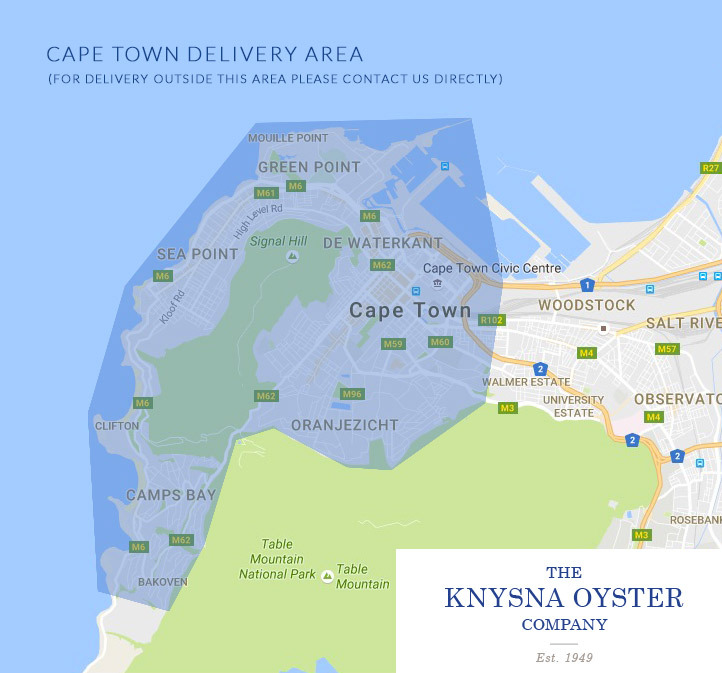 We do offer a delivery service within Cape Town CBD, V&A Waterfront and Atlantic Seaboard for a R29 flat fee (click here to see map of delivery area). When placing your order please advise (in the comments section) when you would like your oysters to be delivered, as well as your preferred delivery times. For all orders placed outside the Cape Town area, delivery times and costs will be quoted separately. Copyright © Oysters Online 2019 | Our Terms.